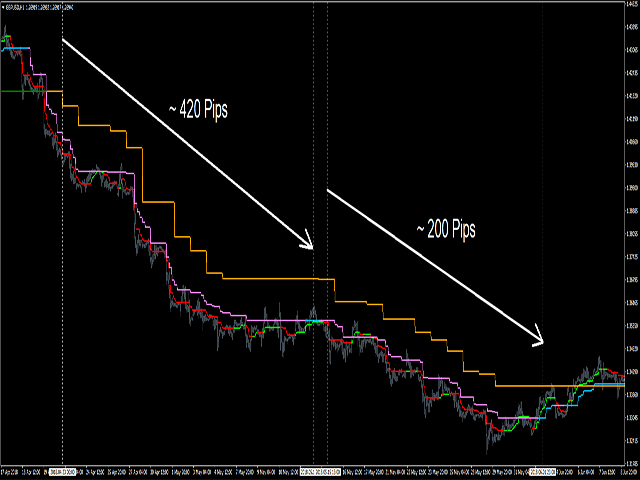 "DigiPipsFX Tiger Jump" é um indicador Multi Time Frame que ajuda você a aumentar seus lucros. Como mostrado, você pode adicionar este indicador de tempo múltiplo a seu gráfico H1 (ou qualquer outro período de tempo que desejar) e detectar o tempo adequado para a entrada. As configurações padrão são recomendadas. Quando todos os prazos mostrarem a mesma direção da tendência, você pode tirar suas posições de Compra ou Venda. Enquanto o quadro de tempo principal (H1) ou o quadro de tempo intermediário (H4) muda de direção, você pode sair e aguardar uma nova configuração. Se houver alguma dúvida, não hesite em me enviar uma mensagem direta. Nota: Se o gráfico e a linha do indicador estiverem desarrumados, não se esqueça de atualizar todos os prazos do seu gráfico e atualizá-los. Okay, so I'll happily change this review, but for now I'm only giving it 2 stars. 1. 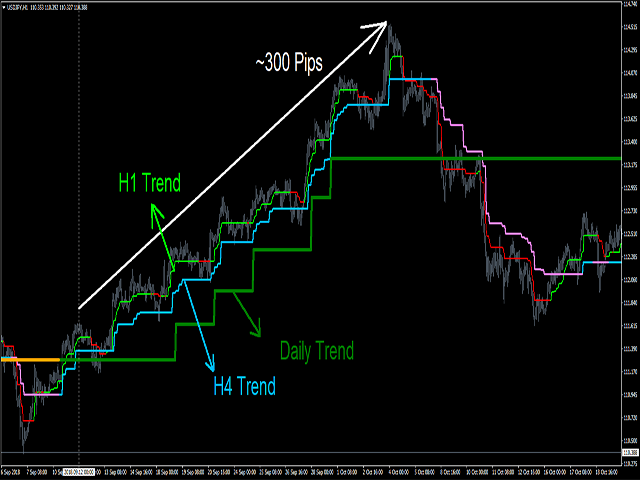 It is great to visually see the trends of multiple timeframes. So you can put on Monthly, Weekly, Daily, and 4 hour for example. I am watching for trend changes both on the 4 hour and on the daily, and then if it's in the same direction as the weekly or monthly, then all the better. 2. I also like that I can do different colors for each which makes it easy to see. 2. 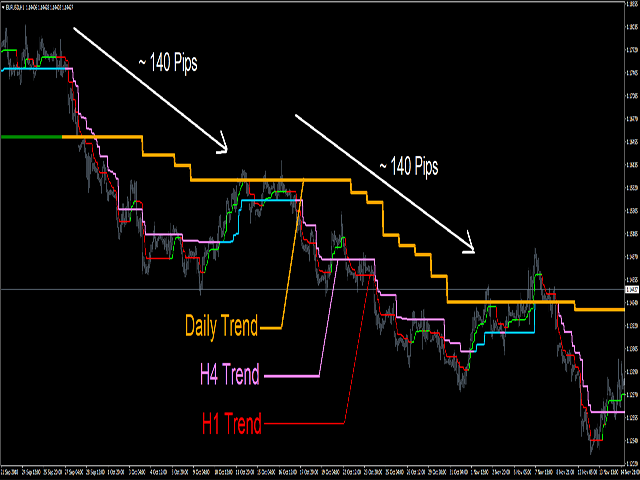 Currently, you need 4 different instances of the indicator in order to have 4 timeframes. It would be much better if there was just one indicator and you can turn on and off whichever timeframes you want to see. Having 4 separate indicator lags my MT4. 3. As an added option, maybe give the ability to label each timeframe, so it can say 4, D, W, M. I'm getting used to the colors I've picked now, but for awhile I had to keep clicking on the indicator to remind myself which one was which. 4. Have the ability for it to monitor all 28 pairs so you don't have to have each chart window open to get the notifications. Currently waiting to hear back from Pezhman on these requests. I'll happily update this and add more stars for any added feature. 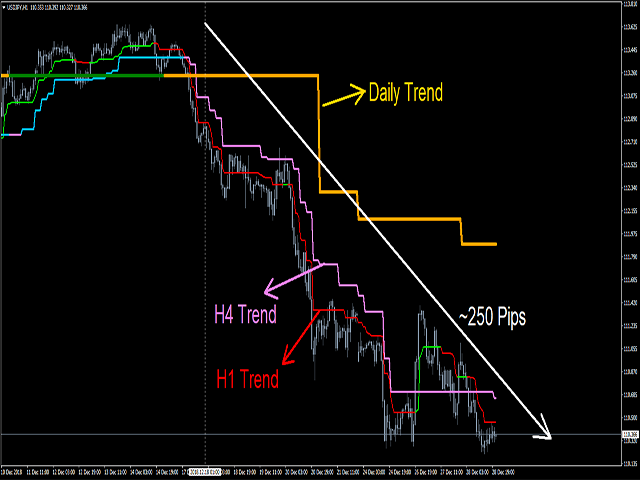 Alert has been modified to be shown on the candle close. Noisy alerts has been solved!